What Trump is thinking ... Last night's strike on Syria, on Day 77 of the Trump presidency, was the first time the nation and the world had seen him act as commander-in-chief. He moved quickly and decisively, but now is a central player in what CNN's Fareed Zakaria last night called "one of the most complicated international crises I've ever seen in my life." Truth is: Trump, for months, has been telling people in private to expect an unexpectedly harsh response to Syrian aggression. The attack had the ancillary effect of separating Trump from Putin, who views the the strikes as "aggression against a sovereign state in violation of the norms of international law," and believes the attack was done under a "trumped-up pretext," according to his spokesman. The White House sees this as "leadership week": the decision to order a missile strike on Syria after its deadly nerve-agent attack on its own citizens, including children; a prime-time announcement to the nation from Mar-a-Lago last night, in which Trump said, "God bless America and the entire world"; his assertive stance on North Korea, with the rogue state testing him by firing a ballistic missile; and meetings with the heads of state of Egypt, Jordan and, continuing today, China. Trump had said Wednesday that the chemical attack "crossed a lot of lines for me ... innocent children, innocent babies — babies, little babies." The official said: "Nothing clarifies the mind like seeing those images." The official said that in his response to the grim, moving photos, Trump was acting partly as a father and a grandfather. As he said said on the campaign trail, he consulted his generals. He took the briefings, discussed the options, then acted after "years of dithering" by the United States, the official added. From Trump's three-minute statement to the nation from Mar-a-Lago at 9:40 p.m.: "Tonight, I call on all civilized nations to join us in seeking to end the slaughter and bloodshed in Syria, and also to end terrorism of all kinds and all types. We ask for God's wisdom as we face the challenge of our very troubled world. We pray for the lives of the wounded and for the souls of those who have passed. "And we hope that as long as America stands for justice, then peace and harmony will, in the end, prevail. Good night. And God bless America and the entire world. Thank you." 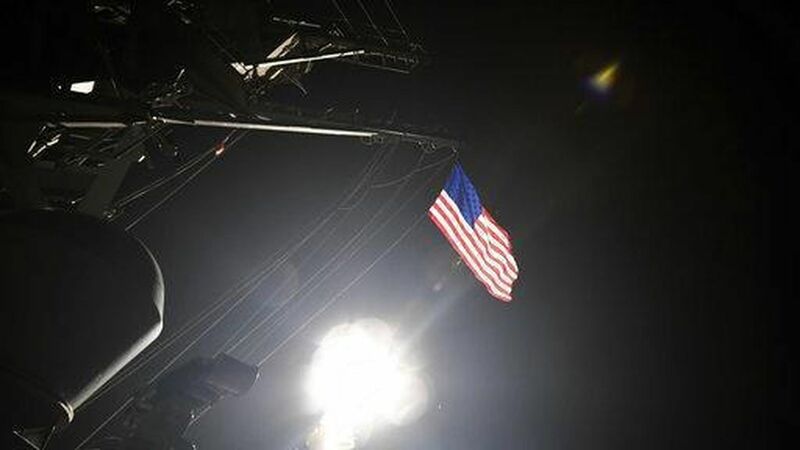 Reuters' Steve Holland and Andrew Osborn: "Two U.S. warships fired 59 cruise missiles from the eastern Mediterranean Sea at the Syrian airbase controlled by the forces of President Bashar al-Assad." "It was the toughest direct U.S. action yet in Syria's six-year-old civil war and leaves Trump facing his biggest foreign policy crisis since his Jan. 20 inauguration, raising the risk of confrontation with Russia and Iran, Assad's two main military backers." AP: "The Syrian military said at least six people were killed and several wounded." Wall Street Journal front page: "President's order throws new administration into center of complex, treacherous conflict." "The N.Y. Times' David Sanger describes "considerable risks for Mr. Trump in the next few weeks, once the immediate satisfaction of making Mr. Assad pay a price for acts of barbarism wears off": 1) "that his gambit with Mr. Putin fails"; 2) "that Mr. Trump, in taking a shot at Mr. Assad, undercuts his own main goal in the region: defeating the Islamic State"; and 3) "that Mr. Trump has no real plan to bring peace to Syria." Risk of widening the conflict ... From a front-pager by WashPost's Greg Jaffe: "The biggest difference that Trump and his commanders confront now [compared with 2013, when Obama last threatened airstrikes against Assad] is the presence of Russian troops on the battlefield and Russian air defense systems that are capable of shooting down U.S. planes." "Trump-Xi summit overshadowed by US strike on Syria," by the Financial Times' Tom Mitchell in Beijing and Demetri Sevastopulo in Washington: "The US military strike could lend credibility to Mr Trump's threat to punish North Korea unilaterally for its repeated missile and nuclear tests — or to the US president and his secretary of state Rex Tillerson's warnings that they would take a tough stance on the Chinese military's "island-building" activities in the South China Sea." Trump to China ... AFP's Andrew Beatty: "Trump, in his signature red tie, warmly welcomed his Chinese counterpart Xi, decked out in contrasting blue ... 'We had a long discussion already. So far, I have gotten nothing. Absolutely nothing,' [Trump] said to laughs from the delegation. 'But I can see that, I think long-term, we are going to have a very, very great relationship and I look very much forward to it.'" "nside Mar-a-Lago's ornate dining room — with gold-trimmed chairs, fine cut glass and polished silverware ... Dover sole with champagne sauce and New York strip steak with whipped potatoes." "The open agenda and the personal setting for the 24-hour summit are designed to allow the leaders to freewheel and build a rapport, in what is the world's most important relationship." Beijing's official news agency Xinhua reported today that "Xi invited Trump to a state visit in China later this year, an offer which it said Trump accepted 'with pleasure.'" Today at Mar-a-Lago, Trump leads an expanded bilateral meeting with Xi at 10:30 a.m. (with cameras briefly invited in), and a closed-press working luncheon at noon. USA Today front page, "Supreme Court showdown simmering for decades," by Richard Wolf: "History was made Thursday in the United States Senate: Democrats mounted a partisan filibuster of Supreme Court nominee Neil Gorsuch. Republicans blew up the Senate's rules to clear the way for his confirmation," expected today. Goes back nearly 50 years: "Before Gorsuch, there was Merrick Garland. Before Garland, there was Miguel Estrada. Before Estrada, John Roberts and Elena Kagan. Before Kagan, Robert Bork. Before Bork, Clement Haynsworth. Before Haynsworth, Abe Fortas. All were blocked, at least initially, from the courts to which they aspired." Trust in institutions at historic low, Axios' Sara Fischer reports: A 2016 Gallup poll ranks the least-trusted U.S. institutions. Not surprisingly, television, newspapers, big business and Congress all rank at the bottom of the list with less than 10% of Americans having a great deal of confidence in those institutions. 7. Futurecast: Danger of the "Internet of Things"
Away from the headlines, a black market in computerised extortion, hacking-for-hire and stolen digital goods is booming. The problem is about to get worse. Computers increasingly deal not just with abstract data like credit-card details and databases, but also with the real world of physical objects and vulnerable human bodies. A modern car is a computer on wheels; an aeroplane is a computer with wings. The arrival of the "Internet of Things" will see computers baked into everything from road signs and MRI scanners to prosthetics and insulin pumps. There is little evidence that these gadgets will be any more trustworthy than their desktop counterparts. Hackers have already proved that they can take remote control of connected cars and pacemakers. 8. The power of "story stocks"
N.Y. Times Business front column by James Stewart, "Bewitched by the Tesla Story": "Tesla has ascended into a rarefied realm of so-called story stocks — companies that have so bewitched investors that their stock prices are impervious to any traditional valuation measures because their stories are simply too good not to be true." "And to the dismay of short-sellers, who believe they have ample rational reasons to bet against such stocks, their share prices can stay in the stratosphere for years, even decades." "The U.S. government is trying to unmask an anonymous anti-Trump Twitter account," by The Intercept's Sam Biddle: "Soon after Donald Trump's inauguration, persons critical of the president and his administration began creating anonymous Twitter accounts claiming to be dissident members of the federal government, such as the famous 'Alt BLM' and 'Rogue POTUS Staf' users." "Twitter is filing suit against the U.S. government, exposing an attempt [by the Department of Homeland Security] to expose and attack one such account," @ALT_USCIS. "These Are the World's 50 Best Restaurants," by Bloomberg's Richard Vines: "Eleven Madison Park in New York triumphed ... in the World's 50 Best Restaurants awards, becoming the first U.S. establishment to win the top spot since 2004." "Chef Daniel Humm's contemporary American restaurant toppled Italy's Osteria Francescana, which came in second after winning the title for the first time last year. Spanish restaurant El Celler de Can Roca came in third."